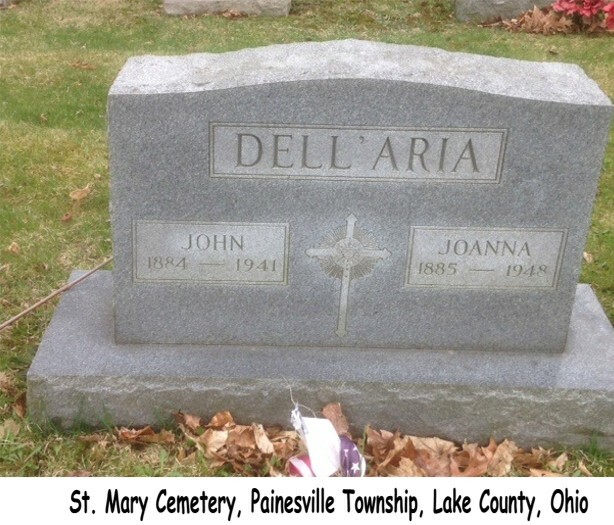 Giovanni Dell’Aria first appears in the Painesville, Ohio, area about 1918. In America, Giovanni Dell’Aria was known as John Dellaria. Giovanni Dell’Aria, son of Giovanni Dell’Aria and Maria Lunetta, was born on January 20, 1884, at Caltanissetta, Sicily. He married Giovanna Barbera, daughter of Salvatore Barbera and Maria Seggio, about 1906 at Italy. Giovanni died on October 4, 1941, at 381 South St. Clair, Painesville, Lake County, Ohio, at age 57 from congestive heart failure. His body was interred at St. Mary Cemetery at Painesville Township, Lake County, Ohio. Giovanni Dell’Aria immigrated to the United States in 1914. He migrated to Painesville between 1914 and 1918. His wife and son joined him in Painesville in 1921. John was retired from the New York Central Railroad. He worked for them for ten years. 2. Mary Dellaria was born about 1927, at Ohio. She married Michael Geraci.